A few thoughts as Chicago prepares for its biggest hockey night in years — the Hawks are honoring Bobby Hull and Stan Mikita before their game against San Jose. Score four -- For a team like the Vancouver Canucks, four goals in a game is a lot. Four in a period is almost unheard of, so you can imagine how happy they were after getting four on 23 shots in the first period of a 6-2 blowout of the Nashville Predators. The Canucks, who rank 26th in the NHL in scoring, scored six goals for just the second time this season. They’ll need all the confidence -- and goals -- they can find. 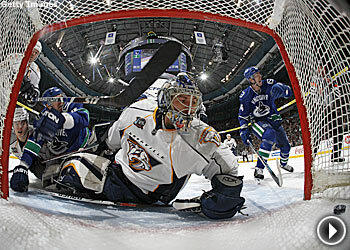 The Canucks and Predators share eighth place in the West with 76 points, though the Canucks have a game in hand. But Vancouver starts a four-game road trip after Saturday’s home game against St. Louis. Where’s the D? — The Boston Bruins’ defense picked the wrong time to spring a leak. The Bruins’ defense and goaltending has been superb this season, making up for an underpowered offense and keeping Boston among the top eight in the Eastern Conference. But the B’s have had a miserable week, losing 10-2 in Washington Monday and allowing eight unanswered goals in Thursday night’s 8-2 rout by the Toronto Maple Leafs at TD Banknorth Garden. "I don't think it's time to panic," Boston coach Claude Julien said after his team’s third-straight defeat, including a 1-0 overtime loss to Florida Tuesday. "It's certainly time to make the adjustments and address. I don't know if it's we're totally out of sync or the pressure. We've just got to take a step back." Goaltender Tim Thomas, the winning goalie for the East in the All-Star Game six weeks ago, has had an especially bad week. He was routed in Washington’s six-goal first period and KO’d again after allowing four second-period goals to Toronto. Goaltending dilemma -- Florida coach Jacques Martin has the opposite problem of the Bruins -- one of his goaltenders has been playing almost too well. Craig Anderson wasn’t as flawless as he had been during back-to-back 1-0 shutouts, but he did stop 25 shots in the Panthers’ 5-2 victory over the Pittsburgh Penguins. nderson got a rare chance to play on Sunday against the Islanders when Martin wanted to give All-Star Tomas Vokoun a break. But Anderson has played so well that it’s going to be tough to justify taking him out of the lineup. Dubie, Dubie, don’t -- New York Islanders coach Ted Nolan had the same dilemma as Martin -- how long to go with a hot backup goaltender. Even with starter Rick DiPietro available again after missing two days following his grandmother’s death, Nolan opted to stick with Wade Dubielewicz against the New York Rangers Thursday night after the backup netminder beat the Rangers in a shootout Tuesday. It didn’t matter. Dubielewicz made 24 saves and played well, but the Islanders’ defense didn’t in a 4-1 loss at the Nassau Coliseum. "He's a hot hand," Nolan said. "You can second-guess yourself, ifs, ands, buts and everything else. Dubielewicz has been playing well. Ricky's had three or four days off. It's kind of unfair to put him into a situation like this. Now, he's got two practices, and he'll run with it from here on in." The Rangers led 2-0 after one period on a breakaway goal by Brendan Shanahan and a shot from the slot by Sean Avery, who was left all alone. The Islanders never recovered. Expect DiPietro back in the net on Saturday when the Isles begin a four-game trip in Philadelphia. But if the defensive coverage doesn’t improve, Ricky might wish for a few more days off. Stepping up -- With forwards dropping like flies, the Philadelphia Flyers needed someone to step up. Jeff Carter is answering the call. Carter has given a big lift to the battered Flyers as they try to hang onto a playoff berth in the Eastern Conference. He had two goals, including the game-winner with 1:54 left in regulation, in Philadelphia’s 3-2 victory over Tampa Bay Thursday night. "I just take it and run with it," said Carter, a third-year player who has five goals in his last four games. "I've never been in such a situation where you're relied upon so heavily. I kind of like it." Carter has a career-high 25 goals and has provided an offensive boost to a team that’s without Simon Gagne, Mike Richards and Joffrey Lupul. "We need people to step up in the absence of some really good players, and Jeff has done that," Flyers coach John Stevens said. "Carts was really a determined individual tonight. He just seems to be the guy you want on the ice all the time." Hurricane warning -- Don’t look now, but the Carolina Hurricanes are hot. Thursday’s 3-2 win over Minnesota was their third in a row; they’ve won six of seven and are 9-2-1 in their last 12, putting them five points ahead of Washington in the Southeast Division. They blew a 2-0 lead to the Minnesota Wild, but recovered their poise and went ahead to stay on Eric Cole’s goal midway through the second period. The win improved the team to seven games over .500, matching the high-water mark last seen on Nov. 12. And their reward? A day without hockey. Jose’s revival -- Jose Theodore may never be as good as he was in 2001-02, when he won the Hart Trophy while playing with the Montreal Canadiens. But he’s doing his best to make sure the Colorado Avalanche make the playoffs. Theodore stopped 25 shots as the Avs blanked the Anaheim Ducks 1-0 for their fifth-consecutive victory, keeping them seventh in the West. He’s been in goal for all five wins. Theodore has struggled for much of his time in Colorado, but he said he never doubted that he could return to top form. The shutout was the 25th of his career, but he said he’s more interested in victories than shutouts at this stage of the season. And why is he playing like it’s 2002 all over again? Red hot -- Carey Price gave the term “hot goaltender” a whole new meaning. The Montreal rookie stopped 37 shots in the Canadiens’ 4-2 victory at Phoenix despite playing with a sunburned face. Price, who wore a headband to prevent his mask from irritating the burned skin, was eager to atone for a poor showing in a 6-4 loss at San Jose Monday. If he keeps playing like he did against the Coyotes, maybe Carbonneau will bring a sun lamp along on the Habs’ next road trip. Who you gonna call? -- You’ve just earned your first NHL victory, a 40-save shutout win over the League’s highest-scoring team. So Erik Ersberg, who gets the first phone call? “I don’t know,” he said after the Los Angeles Kings’ 2-0 victory over the Ottawa Senators. The problem for the 25-year-old rookie was a simple matter of logistics. Captain Rob Blake has been impressed with the first Swedish goaltender in Kings history. You can e-mail John Kreiser at jkreiser@nhl.com.